Ai Xin Ma Ma is a voluntary organisation made up of housewives and parents of children currently attending the Kindergarten. Such is their enthusiasm that some of the parents stay on even when their children had graduated from preschool. These volunteers are an invaluable help to the teachers. 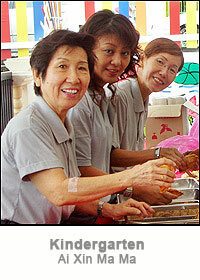 They are “angelic mothers” actively involved in all the activities, whether big or small. They form a strong bond with the children, who later have fond memories of this loving companionship. Every year when school reopens, for the whole week, the Ai Xin Ma Mas report in early to help the confused and crying children settle in. With their patience and compassion, they console and help the children adapt to the new environment and usually by the third day, these children are fine as rain, having made new friends and starting to enjoy themselves. At the end of each month, the Ai Xin Ma Mas are a tremendous help in preparing and serving refreshments to the parents and children during the Birthday Celebration. They also help to clean up after the event.The paper roses, which the children present to their parents, are all made by the Ai Xin Ma Mas. On such outings, you can see the happy faces of the little ones as they are lead by the teachers and Ai Xin Ma Mas, like one big family. The Ai Xin Ma Mas accompany the children and attend to their hunger, thirst and toileting needs, thus making the trip a smooth and happy one for all, especially the children. The Ai Xin Ma Mas work hand in hand with the Ai Xin Lao Shi to nurture the children during the two day one night camp, towards self-confidence and independence. Every year towards the end of the school year, the Graduation and Annual Concert is the busiest and major event of the year. The Ai Xin Ma Mas help to dress and doll up the children to transform them from ugly ducklings to beautiful swans for the Concert. Than Hsiang Kindergarten and Child Care Centre wishes to voice their appreciation to this selfless group of Ai Xin Ma Mas for their invaluable help. Their gentle hands and soft voices are greatly needed in caring for the lovable and gentle little ones.